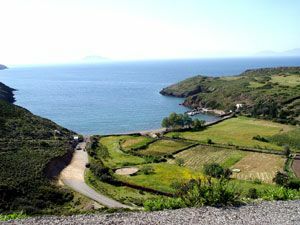 The large bay of Agios Nikolaos is secluded, located apx 12 km from Skala (port), on the northen coast of Patmos. The smaller cove, inside the large bay is known as Livadi Kalogiron (meaning Meadow of the Monks). When south winds blow, the area is a shelter and anchorage for many fishing boats and yachts. The beach is also called Avdelos or Avdelas, named after the chapel of Agios Nikolaos Evdilos or Avdelos. Agios Nikolaos is also the name of the village found there, which along with the chapel, are among the oldest on the island (11th century). There is a small jetty for fishing boats and small boats. It is believed by the locals that the saint protects the boats in case of danger with a light, visible only from the sea, showing the way to the shelter. The Livadi Kalogorion area and beach is to the west of Lampi beach (see separate listing). If you don't use a boat, a dirt road comes there, through the hills above a fertile plain. The landscape is beautiful, with the fields coming up to the edge of the sea. Below the chapel (Panagia Livadiou), there is a small beach with sand and shingle and a small cantina (open only in summer). The small beach at Avdelas is reached by a small track. Fishing boats doing the islands tours often pull here. Once, the area was the home of the many craftsmen, shipped in to build Saint John's monastey. ANCHORAGE INFO: The bay of Livadi Kalogiron is open to N/W winds. It is a good anchorage, with S, S/E, and N/E winds. You should anchor over sand in apx 5m depth. The area provides pleasant surroundings.